You’re hard-pressed to find a horror filmmaker nowadays who brings as much intensity and real-world hubris to the genre than director Jeremy Saulnier; with four movies under his belt, including Murder Party, Blue Ruin, Green Room and now Hold The Dark, he has made films that are able to tap into the darkest minds that plague humanity, and show just how scary certain people can be when forced into realistic situations. There are no ghosts or big scary creatures in his films, just awful people doing the worst things that we as a species can do. In the case of Hold The Dark, it’s about people that say and do certain things out of irrational fear, or for some kind of personal vendetta that can turn a person into the most unstoppable force you could imagine. It is also a thrilling and intense film which, although not quite as narratively strong as some of his other films, has twists and turns to it that can really chill you to the bone. You can take that last part literally, as it is set in the crisp snowy environment of a small town in Alaska – it is here where writer and wolf expert Russell Core (Jeffrey Wright) is summoned after receiving a letter from young mother Medora Slone (Riley Keough), who informs him that her young son Bailey has been snatched by a pack of wild wolves, the third such instance in this town as of late, and who wants him to find and kill the beasts. But Core soon finds out that nothing is as it seems, and finds himself drawn into a wide-scale quest for revenge, especially when Medora’s husband Vernon (Alexander Skarsgård) returns home from serving in Iraq. This movie is best experienced if you go in completely cold (no pun intended), as what the film hints at in the promotional material – a showdown between man and wolf, kind of like The Grey – is not the movie you get. I can see some people selecting this on Netflix and being a little disappointed that it didn’t exactly give them what it was promising, but this being Saulnier you’re going to get an extremely intense, chilling and shockingly violent thriller that is, once again, a showcase for just how evil and merciless some people can be. There are plot developments in this movie that reveal themselves fairly early on, but I don’t want to go into any specifics because they certainly took me by surprise a little bit, and I wish for people to experience it the same way that I did. Sometimes they happen just at the drop of a hat, and can change the entire direction of a scene in milliseconds, whilst also giving extra meaning to moments we had previously witnessed. For example, I was noticing how dry and monosyllabic the dialogue seemed to be during the first act, between characters who just kind of talk the same throughout and never seem to raise their voices, giving off a somewhat pretentious and unnecessarily long-winded vibe; it wasn’t until a turn later on that I kind of understood why this certain character was speaking the way they did, and doing some of the oddball stuff they are also shown to be doing, and a film I at first wasn’t sure what to make of suddenly turned into one that felt a bit more nuanced and sure of itself. In that regard, I appreciated the film for starting off a certain way, only for then to turn itself around in a way that kept my interest throughout. That said, the movie isn’t a perfect one, and unfortunately I don’t rate this as highly as Saulnier’s Green Room or even Blue Ruin (I have yet to see Murder Party), largely because this film can occasionally suffer from a bit of a frustrating narrative. Much of what is actually going on, as well as the reasons why it is unfolding in this certain manner, is never made entirely clear, and I understand that sometimes plots have a fair amount of ambiguity to them, but when you’re setting up a mystery as detailed as this, your audience is going to expect some kind of answers, which the film doesn’t always provide. As visceral as some of the violence can be, sometimes there’s barely a reason for it to be happening at all; people are shot and more often than not killed when it wasn’t really all that necessary, especially when you take into account that the people being slaughtered are just doing their job and not even causing any real obstruction to the person doing the killing. In something like Green Room or Blue Ruin, at least you could understand why certain people had to be killed and for what reason, but here it just felt a little gratuitous at times. However, that isn’t to say that there’s nothing to recommend about the movie, because there’s definitely a fair amount of nice things to say about it. It’s a very beautifully shot movie, mixing the white exteriors of this snowy Alaskan backdrop with the darkened interiors that create a feeling of unease and dread wherever they can; it’s also well-acted, particularly by Skarsgård who becomes a key figure in the film’s latter half (and who, again without giving anything away, has a demeanour to him that is not unlike Michael Myers in this film); and a scene involving a major police shootout is an impressive display of heart-pounding suspense and solid horror-movie direction. Though it’s far from the strongest material that Saulnier has put out, Hold The Dark is a captivating thriller that, like his other films, show that the darkest parts of humanity can sometimes be scarier than a ghoul in a haunted house. 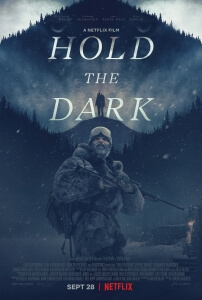 Hold The Dark is a highly suspenseful and intense thriller which has a good amount of twists and turns to it that keep you interested, but fans of director Jeremy Saulnier might be let down by its lesser narrative skills than some of his previous work, as well as some violence that feels a little more gratuitous than usual.